Festool OF 2200 for inlay work? I have been using a small 1 1/4 hp Makita router with a plunge base to do everything. I am looking to upgrade to either the OF 1400 or the 2200 to have better all around performance (chamfering, rabbiting, dado work) and to use with free hand inlay work. Also it would be nice to use bits with a 1/2" shank for some of these tasks. I find that when using my Makita it gets pushed around very easily when I am routing the recess for an inlay and from what Ive gathered, the extra weight of a larger router would be to my advantage. I was pretty set on the 1400, but I have noticed that others state it is difficult to see the router bit with the dust attachment on. Being able to see the bit is critical so I can meet my scoring mark precisely. I notice the 2200 has awesome dust collection and a great line of site to the bit. But I know I don't necessarily NEED that power and the 1400 would be plenty powerful for what I do. Does anyone have any thoughts on this matter? If the 1400 had a built in dust port similar to that of the 1010 or preferably the 2200, the 1400 would be my choice. And of course I like to think I would use the 2200 to its full potential, but I don't see myself doing that for quite some time. Re: Festool OF 2200 for inlay work? One factor you have to weigh in to the decision is...weight. The OF2200 is quite a stout machine and therefore, it may or may not be comfortable for you to operate for detail work like inlays, depending on their nature, etc. The OF1400 is more agile in that respect. Hi, i have the 2200 and it is quite heavy, but given you dont need the power it may be better to add some weight to the 1400 or even your makita. From what i gather the of2200 is geared towards being mounted in a router table and can be very cumbersome for hand work although i have got used to it. you would need to remove the bottom shroud for visibility if you are using small cutters but you should still get good extraction if you have a powerful vac. i dont do very much detailed work especially along the lines of marquetry but i guess you need to balance somewhere between too much and little friction. The bigger routers are really a sort of final step before getting into spindle moulder territory. The big powerful routers are usually heavy, which for me isn’t a problem, as when routing free hand etc, the weight helps with wielding. When used with a table, obviously the weight has no noticeable effect. The 2200 is quite heavy, and very powerful and makes work with hardwoods detailed cutters a breeze. I have a few routers, and always seem to use the smallest I can get away with for any given job, apart from my table mounted ones. 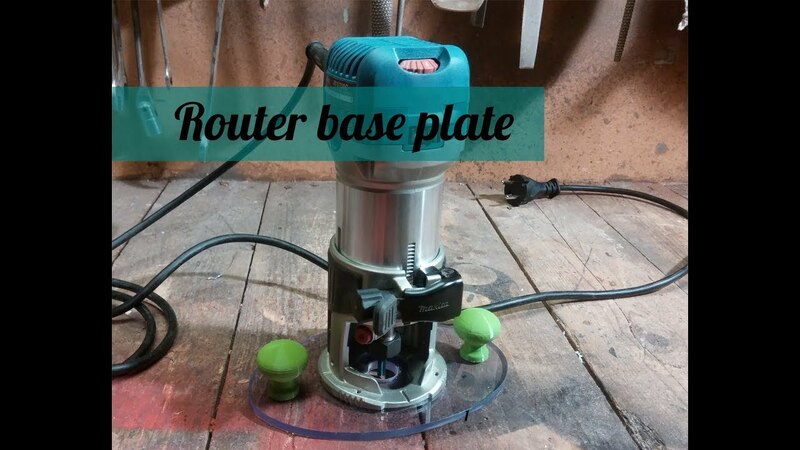 Do you need a heavier router or just a larger baseplate for your current Makita? Having something like this would give you a little more control by having more of a lever arm to hold on to and maneuver the router. You can make your own with a piece of acrylic and drill it out as needed. That’s a good idea, maybe even bigger and stouter and add some lead weight. And with the larger surface area you can add a very effective light. Do you use yours with a CMS set up? Ive read elsewhere people like to use their 2200 free hand when they can, but being able to easily remove it from certain router tables can be too time consuming to make it worth the effort. Thanks everyone for the replies, right now I'm planning to play around with the makita for my inlay stuff by adding a heavier/ wider base to the plunge base. shouldn't be too difficult, just drilling out the hole pattern and I have some 1/4" stainless I could play with adding to it... Might be a bit of a Frankenstein but who cares as long as it works! I might however look more seriously into the 1400 for the do everything router, dados and such, and perhaps later a cheaper PC or Triton router as a designated table router. For the price of the 2200 I could potentially get this combination. Does that seem like a sound decision to folks? I guess before I was thinking the 2200 would cover both of these territories (and perhaps the inlay work) but it does seem like it would definitely be overkill to do everything with. I have the PC 75182 and a router lift in my router table. Works well and allow adjustment from the top. I also have a Festool OF 1010 for handheld routing. I agree. For inlay work you need your arms to rest on the work piece/table and control the router with your wrists. As great as it is OF2200 will not help with that.